The placement of tooth implants is a rapidly growing field. Increasingly, patients are seeing the vast benefits of this dental restoration. Along with popularity, dentists are noting the need for areas of improvement based on what they are seeing in their patients. The new Straumann Pro Arch is taking those needs into consideration. Our team at Dental Implant Center at Walnut Creek is here to show you the difference. • Adequate bone mass. For a majority of patients, the doctor will be required to perform a bone graft procedure before implant placement. While this is a relatively simple process, it does increase the amount of time to allow sufficient bone to replenish adding weeks to the process. • Many months of healing after your dental implant is placed. The healing process for implants is called osseointegration, this means that your living tissue heals by bonding to the titanium implant, making the implant part of your body and therefore strong. This process can take up to six months. Though the above problems are relatively small, they do cause an increase in time from beginning to end. Some patients would rather not take the time if they can be given a faster, equally compatible, and satisfactory solution. This is where the rapidly evolving solutions come into play. Dentists have voiced the hurdles that patients meet when getting their implants placed and solutions are being made. 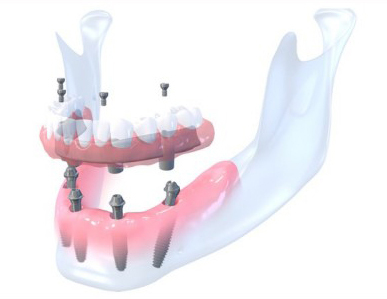 This redesign of the dental implant is a solution to length of time and healing related problems. The new Straumann Pro Arch offers an implant system that combines several treatment steps, and small differences in the actual implant design which reduces the complexity of placement without compromising the outcome. Our team, including Dr. Keith and Dr. Gibbs, are excited to discuss this new design with you. This is a fantastic solution to the problem of total edentulism. If you have lost all the teeth in one or both of your arches, we can replace them with a permanent denture. Essentially, the Pro Arch Overdenture gives you a permanent set of fully functioning teeth. The Pro Arch solution gives you a set of teeth that are easy to take care of and nearly identical to your natural teeth. With removable prostheses you constantly have to worry about taking extra steps to clean and store your device. Fixed Pro Arch Overdentures give you freedom from difficult care instructions and the ability to eat and sleep as you normally would – in total comfort. • Less invasive surgical procedure. We do not need to drill or place as deep as before. • The smaller-diameter implants have the same clinical performance as regular-diameter implants. • In many cases, because of the angle we place the implant at and because it is not placed as deep, we are able to avoid performing bone grafts before placement, saving an increased time step in the procedure. • We have found that this new design allows for faster osseointegration. This new implant is more quickly bonding with your bone and tissue. • With faster healing comes more stability. On average, we are seeing healing times occur two to three weeks faster, helping the patient have a more stable structure more quickly. We are happy to discuss the Pro Arch Overdenture with you. We can show you the difference that a fixed overdenture can make in your life. Contact our East Bay office in Walnut Creek at (925) 266-3550.